The story of social progress is complicated, and that’s why Bill Gates is always looking for a better way to communicate it. Recently, Gates shared an infographic that tells the story visually. Gates is part of a group of thinkers, authors, statisticians and historians who attempt to explain why today the high time to be alive in all of human history is! While the data supports the argument, a host of psychological barriers makes it difficult to get the news across. One of those psychological barriers is what Nobel Prize-winning economist, Daniel Kahneman, called availability bias. In short, what we see or read every day skews our perspective. Also, since ‘bad is stronger than good’—we pay more attention to threats than positive news—the alarming news passes more easily through our mental filters. 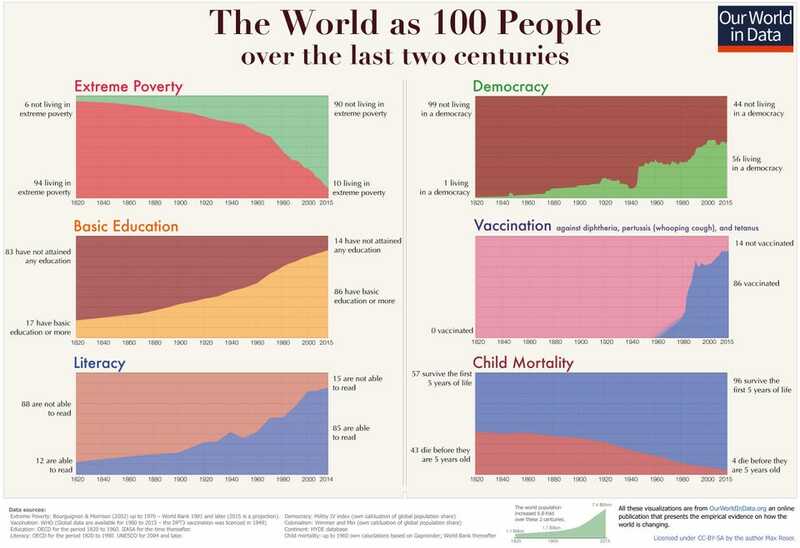 In survey after survey, most people don’t know how much progress we’ve made in the last 20, 50, 100 and 200 years simply because they don’t see it every day.